The ExaLINK Fusion CPU Module is an optional, add-in module for the ExaLINK Fusion platform. The module is built around a powerful Intel i7 CPU. Users are given full control over the CPU. There is no sandboxing, virtual machines, or isolation required. The module allows users to run customized processing and monitoring functions on a dedicated CPU inside of the Fusion chassis. In addition to an Intel i7 CPU, the module includes an embedded ExaNIC X40 network interface card. 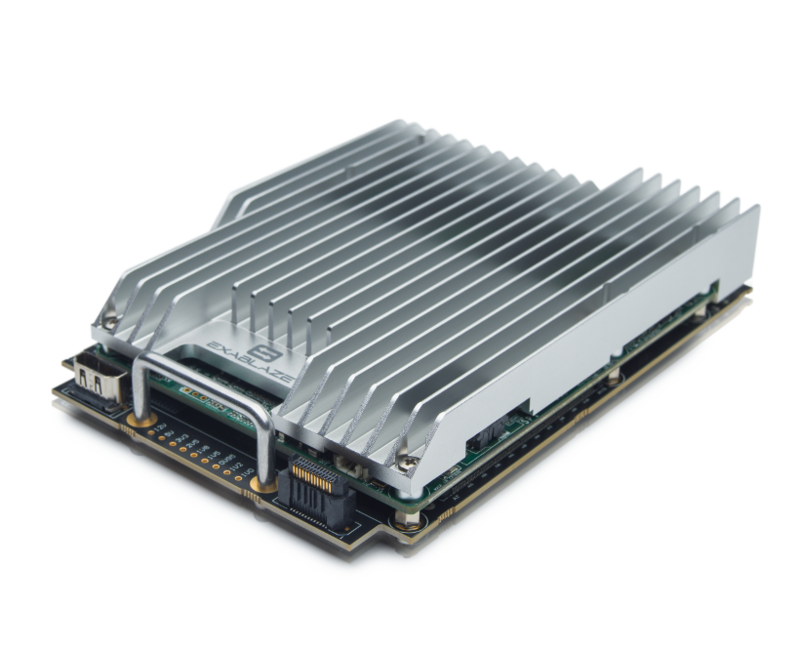 The ExaNIC X40 is an FPGA powered, ultra-low latency network card. It can be used as a regular ExaNIC network card, interfacing each of the 8x 10 Gigabit Ethernet interfaces to the L1 crosspoint, the front panel, and/or FPGA modules (if fitted). It can also be used as a network application card, giving users the ability to accelerate custom network functions by running their own firmware on the embedded Kintex Ultrascale FPGA. The CPU module is equipped with several high speed SSDs using NVMe and mSATA interfaces. The ExaLINK Fusion platform features transparent tap and patch features which enable line-rate capture to disk. Flow steering features on the ExaNIC X40 can be used to deliver packets to the right receive buffer for immediate processing, while flow hashing can be used to distribute packets across multiple CPU cores for demanding capture applications. Built-in time-stamping functionality on the ExaNIC X40 records each frame’s arrival time to a granularity of 6.2ns and can be synchronized with PTP time sources.